Clarence Endicott Tucker was born in Nottingham, Nottinghamshire, in 1896, the eldest child of ticket and sign writer Samuel Henry Tucker (1862-1938), known as Henry and originally from Axminster, Devon, and Emma Florence née Laughton (b 1870) eight years his junior and originally from Peterborough. Samuel and Emma were to have six children; Clarence Endicott (1896-1918), Frederick (b 1898, emigrated to USA in 1920), Drusilla Olive (b 1900), Louisa May (1904-1955), Wilfred Arthur (1908-1981) and Samuel Morris (1910-1981). Two further children, Doris and Lilian, died in infancy. In the 1901 census the family were listed living at 13 Wine Street, on the corner immediately behind William Maynard's shop in the Borough. By the time of the 1911 census the family were living at 10 Silver Street and 15-year old Clarence was employed as a Junior Clerk at a cheese and butter factory and was working for Aplin & Barrett in Newton Road. Certainly by 1918 Samuel and Emma were living at 2 Church Terrace, Silver Street. Clarence enlisted at Yeovil on 4 September 1914 for the duration of the war and became a Private (Serial No 241195) in the 1st/5th Battalion of the Somerset Light Infantry. In May 1916 a large draft of nine officers and 449 other ranks arrived from England. Clarence was almost certainly among this contingent. The battalion was temporarily divided during the ensuing hot weather with some companies going to Chakrata and the remainder to Meerut. The following months were mainly occupied in training the draft but even in the hills little was done beyond this owing to the exceptionally wet season. The Battalion was reunited in October at Meerut. On 26 April 1917, 17 officers and 838 other ranks of the Battalion sailed on HMT Chakdara from Bombay, landing at Suez, Egypt, on 11 May 1917, becoming part of 233rd Brigade, 75th Division - part of the Egyptian Expeditionary Force in Palestine. However, it is most likely that Clarence was seconded to the 2nd/5th Battalion of the Somerset Light Infantry since they were the only Battalion of the Somersets to remain in India for the duration of the war. According to the Regimental History of the Somerset Light Infantry "The 2/5th Somersets, who were stationed in India throughout the War, had led a disturbed existence from 1917, quelling riots in the Arrah and Gaya districts around Dinapore. In 1918 the forces of the Barrackpore detachment prevented some minor disturbances in Calcutta from developing into serious riots." 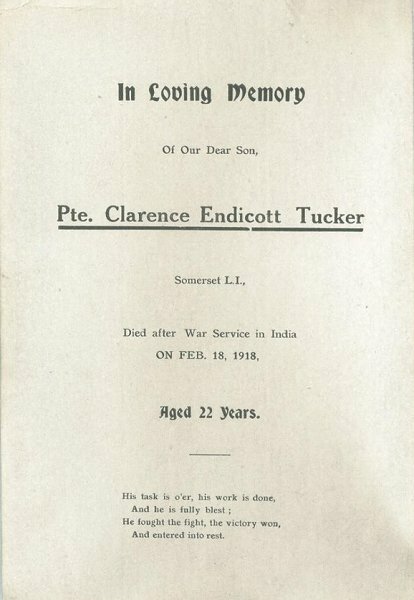 Clarence Tucker died of pneumonia in India on 18 February 1918. 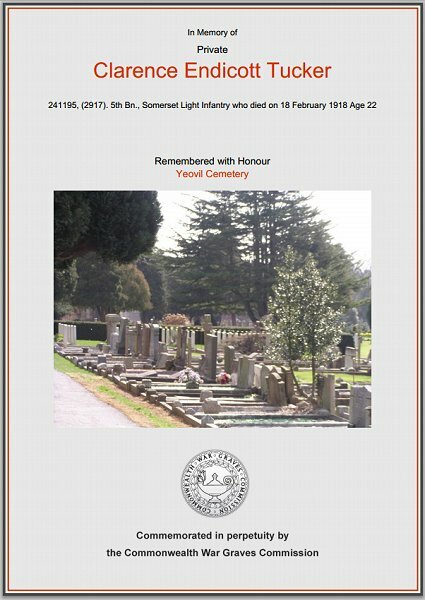 He was aged just 22 and his remains were brought back to England and he was interred at Yeovil Cemetery (Div.B. 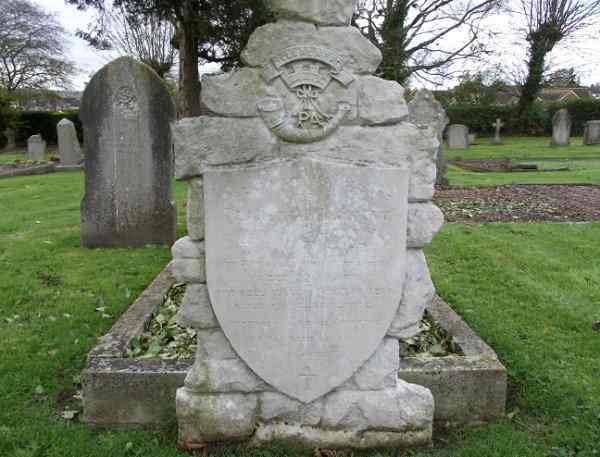 Grave 2777) and his name is recorded on the War Memorial in the Borough albeit inscribed incorrectly as Tucker, GE rather than Tucker, CE. "This is a memorial card to my father's brother, Clarence, who died in the First World War. The card used to hang in a heavy brown plaster frame in my grandmother's house in Westfield Avenue. I found it after my aunt died in around 1992 or 1993 and we were clearing out her house. Unfortunately the frame (which was a very sorrowful item, with a plaster relief of soldiers with their guns reversed and with their heads bowed) was badly damaged, showing large parts of the white plaster underneath. However, the card itself was undamaged and I managed to salvage it. My father, who would have been 7 years old in February 1918, used to say he remembered seeing the hearse with the coffin arriving outside the family home after Uncle Clarrie's remains were brought back from India to England. That must have been in Silver Street. Apparently (according to my father), he died not of injuries but of pneumonia, after getting very wet on active service and being too exhausted to change out of his wet clothes." A memorial card kept by Clarence's mother at her home in Westfield Avenue. The Commonwealth War Graves Commission certificate in memory of Clarence Tucker. Clarence's headstone in Yeovil Cemetery.